It was the final day at the ITA National Indoor Championships and it certainly went out with broken records and screaming Buckeyes. 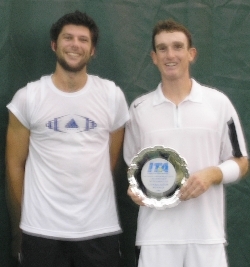 Scott Green & Ross Wilson (pictured right) became hometown heroes as they are the only doubles team to ever win the ITA Indoors title twice. It was also twice as exciting for them since they got to do it in front of a large, loud crowd of Ohio State fans. The pace was fast, as hard volleys and fast serves ruled the game, and it was a nail-biter until the end for the multitude of fans. They finally took it at 9-7 and the cheers could be heard all the way to the Buckeye Stadium. The Ludovic Walter/Benjamin Kohlleffel (pictured above in the middle, with their coaches alongside) match looked like it was going to be a lot like the men's doubles -- all serve, few long points. The first set went through with only the one break for UCLA's Ludovic. He kept it for a 7-5 take. The second set, however, was very different. There was actually more playing, but less scoring, as Ludovic captured all the big points and the match for a 6-1 win and UCLA's first men's singles Indoors title. 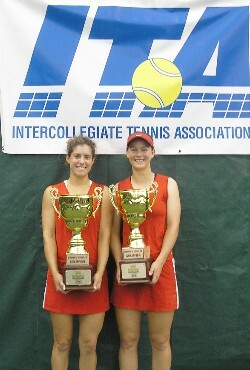 Florida sophomore Diana Srebovic (pictured right) was unseeded at this tournament, but no one told her that. She had all the drive (and talent) of the top-ranked and there is no doubt she will be in that group through the season. 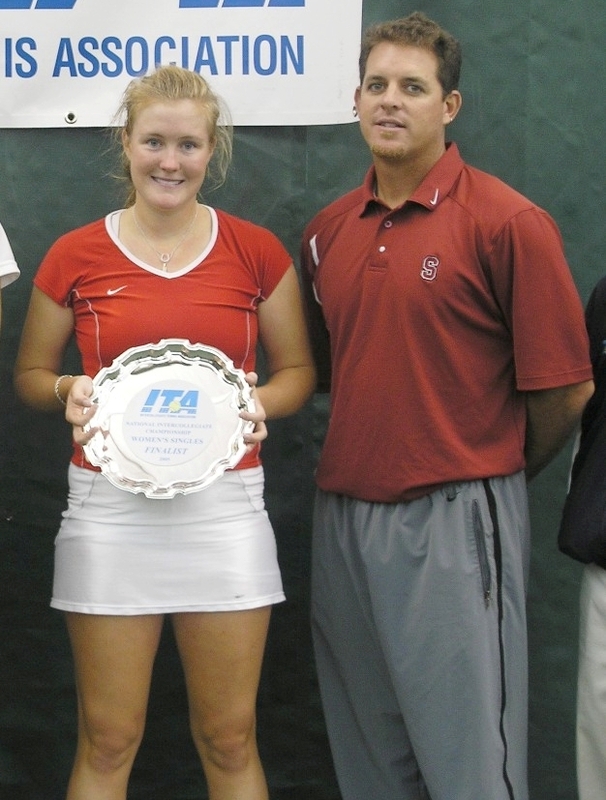 The final match with Stanford's Theresa Logar was a spectacular one. Two players who both had great all-around games -- from serve to forehand to volley -- made for many crowd pleasing points. The games were close, with frequent deuces. The 7-5,6-4 score was true to form with Diana having just that small edge throughout. Stanford Assistant Coach Frankie Brennan (shown here with Theresa Logar) kept busy today as he went from women's doubles to singles to singles consolation. He somehow managed to keep up with it and bring the Stanford women home with four trophies. It was deja vu yesterday at Ryler Deheart's (pictured below, far right) match as the Illinois senior once again lost a tiebreaker in a serving duel first set and then came back as the clear winner in the second. 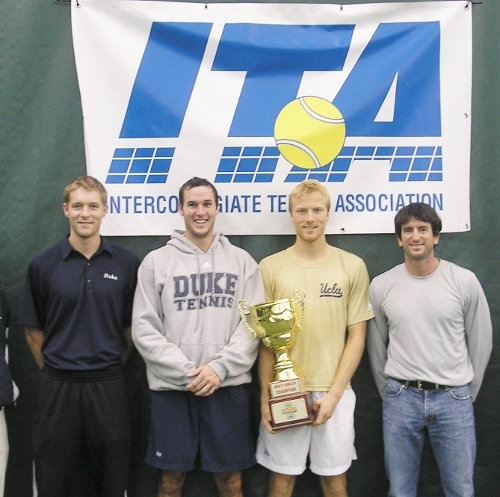 The only difference in today's consolation final with Duke's Jonathan Stokke (pictured below, right) was that the second set was 6-2 and the third did not go into a tiebreaker. That's not to say the last two sets were not good tennis. Both players displayed a host of great shots and kept the onlookers guessing. In the end last year's champ left with Assistant Coach Kent Kinnear with another trophy this year. Though it was not the top prize he hoped for, he was still a happy Illini. An honorable mention has to go to Duke Assistant Coach Ramsey Smith, a former all-american standout himself who made it to the semis at this event. He kept his coaching and good cheer up through two losses for two players today. His players certainly picked up on his good sportsmanship and also deserve credit. It was a great day for Stanford's Anne Yelsey (below, left). 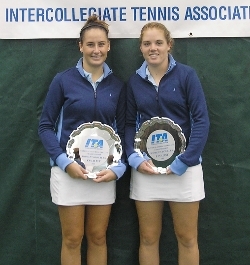 First she partnered with Alice Barnes (below, right) to take home the women's doubles title, giving up very little to Sara Anundsen & Jenna Long. The North Carolina duo had gone through the draw unseeded, creating quite a few upsets, but it was the end of the road as they faced an NCAA champion partnered with an NCAA finalist. The Cardinals took the crown with an 8-5 win. I couldn't have asked for a more exciting four days at my first ITA Indoors. A special thanks to the Racquet Club of Columbus, Tournament Director Al Wermer, the Ohio State University, ITA Media Director (the best in the business) Casey Angle, my friend Colette Lewis from Zoo Tennis and the University Plaza Hotel staff who all helped make it a terrific event I look forward to returning to.